Here's a good tip for those who leave comments on an old post from a Blogger blog: now you can get email notifications if someone posts a new comment. Just check "Email follow-up comments to my Google account address". Blogger also provides feeds for each post's comments, but not many people use feed readers and those who use one don't want to increase the number of subscriptions with "weird" feeds that are useful for a limited time. we really need this feature ..
wow I'm so impress now we same level with wordpress.Thanks blogger this feature sure many blogger will love it.Let compete each other like Boeng and Airbus.Thumb up! I want to reply to specific post. While this is a good feature, I do track it generally by this search query. Thus it is not all that impressing as others have made it to be. It's a very important function.I like it. This is the second time I test it. You could alternately subscribe to the comments feed for the entire blog, so you wouldn't have the limited time issue you talked about. Also I have seen many Blogger owners adding a "recent comments" box to their page which helps frequent readers continue following comments on older posts as well. That's not to say this new feature isn't useful as well, because it is. That's not the same thing. This feature lets you track all the follow-up comments for a certain post. It would be nice to receive only the replies to your comment, but Blogger doesn't offer the option to reply to a comment. Comments are one of the weakest points in Blogger and there are many things that could be improved (adding the comment box to the blog post, rich text editor, spam filter, stats). This function looks like comments in Flick which I can keep an eye on. Can blogger give usa better commentpage. Something in line with Wordpress...blogger has a comment page that is years old..update please. Also how do you reach the comment feed? Finally! I've been asking for that feature for a long time! Woot! How do I disable this email notifications thing, if I don't want to appear it in the comment box...I will be glad with any help. I don't think there's an option to hide that text. how do i turn off the notifications? There's an option to unsubscribe at the bottom of each email. Actually. it seems like it appeared after I put it in....How can I get that link? Is there a setting to allow my comment notifications have the user's email address, so I can reply to the comment via email? I've had other people do this with my comments on blogs using other blog software, but the comment notifications I get from blogger always come from "noreply-comment@blogger.com". This option should be for ALL email addresses, not just Google Accounts. Most of my friends, for example, don't use gmail, and generally they use either Hotmail (Windows Live) or Yahoo. That of course because those two companies might be the most popular in IM and Email internationally. I strongly suggest that Google solves this. At least it should be an option for the blogger. That would really help a lot. I need a feature that allows me to reply to my readers' comments on my blog AND send them a notification via email that I have done so! It's a pain trying to do both manually! I've been trying to find a way to do this but nothing has worked out. Any suggestions? If they want to receive notifications when someone posts a comment, your readers should click on "Subscribe by email". good tip for those who leave comments on an old post. 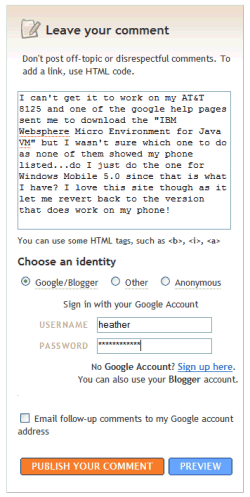 how i do to get a simple comment box to work on my blog site'??? ?